Indian Tents now provides best services and management also they make the sound party atmosphere which is so glamorous and colorful look and stylish. It bring a amazing surrounding and gives outstanding and amazing look. Exclusive Maharaja Tent:- Exclusive Maharaja Tent are genuinely designed and enormously large Maharaja Tent with hut shaped roof. 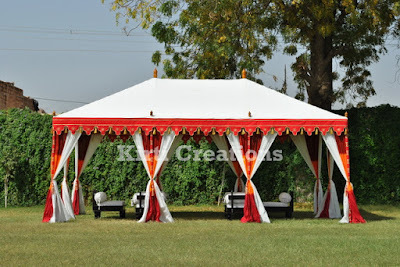 This tents is open in front side and closed back side and using two unique color red and cream and folded curtain which superbly attached with poles. This tents is water resistant tents and using premium quality of fabric sheets which also available in different color. You can buy Indian Tent for Party with budget costs. It is waterproof tents and using excellent fabrics sheets. It is easily fax and remove any grass ground. Perfect design and hut shape for front side and close back side. Using two colour red and cream and genuinely folded curtain. Indian Tents very attractive and naturally design tent. The manufactured of tents under the expert are using best quality of fabric sheets and material. We have wide range of Indian Tent for your occasion and party. Function and party are definitely a very special moment in your life and everyone want to makes memorable so choose Indian Tent gives attractive and outstanding look. We supply a quality based tents to all over India. It is quickly assembled and dissembled in any types of ground. Classic Maharaja Tent:- Our Classic Maharaja Tent is best in all kinds of function weather it can small and large. It is made up multi-color of fabrics and it come in hut shape. It is easily set up on any types of ground. Indian Tent for Party is available with the cost-effective rates. Indian Tent is come with wide collection of sizes, shapes, patterns and decoration. It is so beautiful and eye catching tents which makes your occasion stunning and gorgeous. 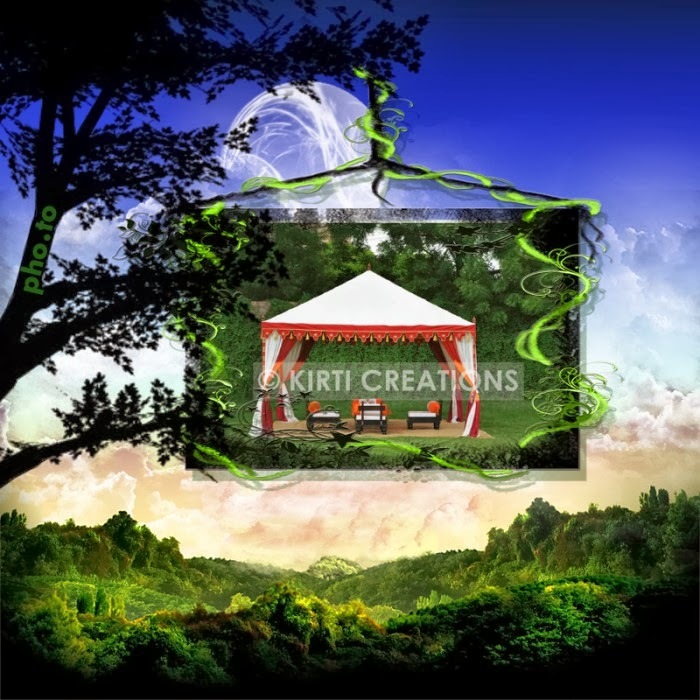 Handmade Tents is the best option for celebrating the function and occasion. Indian Tents is one of most valuable company in India, because it’s provided a best services and management. Our company use only best quality of things. It provided so many types of Tents according to functions. Stylish Maharaja Tent:- Stylish Maharaja Tent is providing our clients goods quality of tent. Maharaja tent using best quality fabrics sheets and using two beautiful colors white, and light green. The size of Maharaja Tent is 4m x 6m, 6mx10m, 8mx12m 10mx15m and 12mx8m. Maharaja Tents offers the customer various types of patterns and colors. It is easy to assemble and dismantle. • The total size of tents is 4m x 6m, 6mx10m, 8mx12m 10mx15m and 12mx8m. Indian Tents are high quality and unique tent to the esteemed the customers. The manufactured of tents under the guidance of experienced and professional who ensure to utilize optimum quality material of tents.